Spring is upon us, and teachers everywhere lament how difficult it is to keep students engaged as they are getting ready for state assessments and AP exams. It is also difficult for us teachers to stay engaged with new lessons and innovative ways to keep students engaged because we have been burning the candle at both ends for so long, and we see how our students are being drilled in other classes. What do we do when we have just hit the wall? Yes, Spring Break is coming up, but what do we do between now and Spring Break? Or how do we structure our lessons for the last marking period between the return from Spring Break and the end of the school year? In my last post I wrote about focusing on the right things in the class. But, how can we determine what are the right things to focus on when our students seem to swing between climbing the walls and slumped over their desks? Some teachers might even be thinking about the next school year already, declaring this year a wash. How can you keep your spirits up for the rest of the year without writing it completely off? You need time for yourself in order to take stock of what has worked so far this school year and what you need to work on for your students to achieve so they’re ready for the next level. Also, take time for yourself to regroup so you have the energy to help your students the best way you know how. That may include taking advantage of the longer daylight hours to take a walk after work. Or it may mean having a cup of coffee a little earlier in your favorite, quiet corner of your house in the morning, or it may mean sweating it out in the gym. But you need that time for yourself in order to be at the top of your game for your students, your friends, and your family. Ask your students what they need in order to be successful for the rest of the year and what might help them grow through the rest of the spring semester. Collaborate with others in your department for planning lessons in order to work smarter, not harder because this time of year is hard enough. Think about common planning around those field trips or assemblies. Also, it might be time for your department to observe each other in order to get some fresh eyes for your lessons in order to help you keep reaching all of your students. 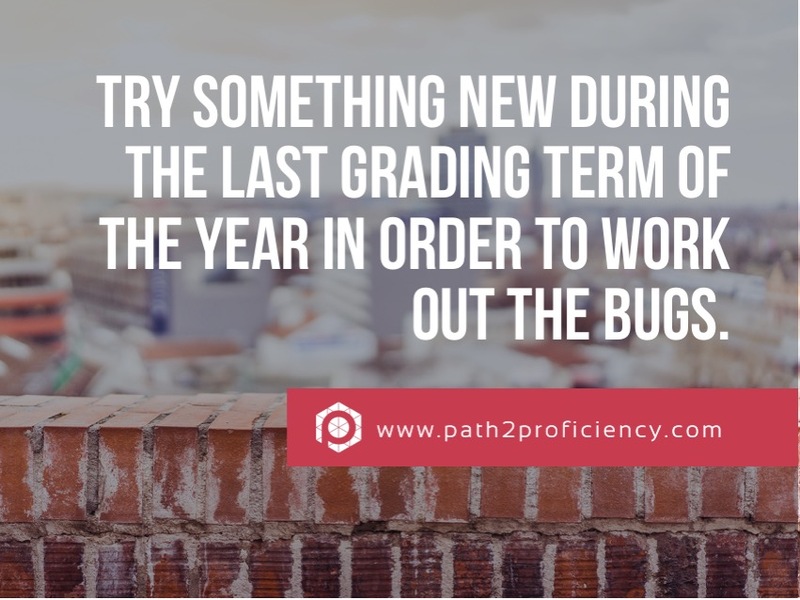 One thing I have liked to do is try something new during the last grading term of the year in order to work out the bugs, so I could start off knowing how to present it to my students in the fall. I like this type of playing with a new idea because it keeps me on my toes in the profession and helps me develop my craft while helping to keep the students engaged in learning. I’ve had students ask me “Where were these great ideas at the start of the school year?” because they somehow felt cheated that they only got to try something out at the end of the year. Of course, I do various things throughout the year, but my big life-changing ideas, I like to save for the end of the year because I learn from other teachers as I watch and talk and listen and collaborate. I want to have my own spin on something in order to put my own stamp on it. Chef José Andrés uses a separate kitchen as a laboratory in order to experiment with new dishes, and he records his ideas and steps in a journal. Your classroom is your laboratory, and I guarantee you that your students will let you know if your idea was a win or a flop. The key, then, becomes how you tweak it and take it back to them to try again rather than give up. One thing I have to remind myself, when I feel myself hitting the wall, is that I am my own self, and my students are mine, so when I see another teacher doing some activity I’m not doing or other students doing certain work mine aren’t doing, I have to remind myself of what my students and I have achieved together and of the work we’ve done in our class. And the truth is, we’ve worked hard together, and we’ve grown a lot.